Subscribe, and get more from your travels! – Fresh guides, tips and stories direct in your inbox! Keen to hear more from us? If like Steve Tyler you don’t want to miss a thing, then you’re on the right page. All you have to do is enter your email below and you’ll get all of our freshly published City Guides, genuine insider tips and travel adventures from around the world delivered direct to your inbox in a monthly newsletter. We’re also preparing some “members only” content available only to subscribers (coming soon! ), plus we’ll make you privy to selected giveaways and offers. 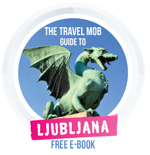 And we’ve even got a bonus gift for you in the shape of an awesome free 22 page E-book to Ljubljana, the enchanting capital of Slovenia. Christmas just came early! (We’ll simply send you a link to download it when you confirm your subscription). We’d be delighted for you to join our 45,000 readers a month… and if for some reason you change your mind, then you can always unsubscribe at a later date. No dramas. Thanks, and happy travels! ONE MORE REALLY IMPORTANT THING!!! After entering your email and pressing subscribe please go and check your Spam/Junk mail folder right away to find your confirmation email. As subscription emails are automated they are often treated as spam by email clients. Stupid clients. Ps. Active on social media? You can also join the conversation on Facebook and Twitter.